The economic damage done by winter storm Jonas looks like it is going to be much higher than many had originally anticipated. As you will see below, Moody’s Analytics is projecting that up to 3 billion dollars of damage has been done, and USA Today is reporting that the flooding along the New Jersey and Delaware coasts was “worse than Hurricane Sandy in 2012″. So all of those that are mocking Jonas as “just a snowstorm” don’t really understand what they are talking about. Large numbers of homes, businesses and vehicles were destroyed – especially right along the coast. This was a major disaster, and it is going to take months of work for many of the affected areas to fully recover. 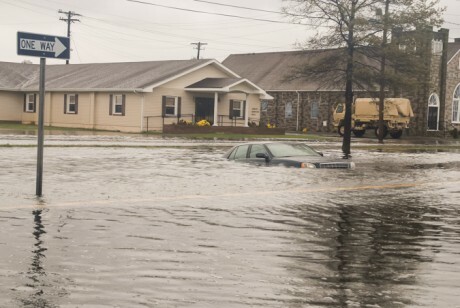 Flooding damage from the weekend storm along the New Jersey and Delaware coasts is already described as worse than Hurricane Sandy in 2012. “The storm surge and pounding waves caused considerable water damage to homes, businesses, beaches and coastal infrastructure,” Aon Benfield said in a report it issued Sunday night. “When combining the actual physical damage to residential and commercial properties, plus automobiles and infrastructure, and adding business interruption losses, we’re potentially looking at one of the costlier winter storm events in recent memory,” Bowen said. Beach communities in New Jersey and Delaware were evaluating the aftermath from the massive winter storm as high tides washed out dunes and brought icy water into the streets. Delaware’s sand-enriched beaches from Lewes to Fenwick Island took a whipping as dunes were flattened and wiped away. The ones that remained looked like a giant front-end loader came through and scooped off the face, leaving a jagged series of cliffs. Sand fencing lay crumpled like the tracks from a derelict roller coaster. And in Rehoboth, the boardwalk buckled in places from the force of waves pounding the boards from the bottom up. Perhaps those that don’t think that this storm was a “big deal” would like to foot the bill for the damage. ← Have You Prepared For Losing Your Job In The Upcoming Depression?